Shrouded by smoke from a fire in California’s parched San Bernardino Mountains, schools in the Victor Valley closed their doors last week. The Pilot Fire was contained on Monday — shortly before the Blue Cut Fire broke out, billowing soot and ash over the valley afresh, forcing further closures. A "smoke wave" describes the type of multiday impacts from wildfire pollution that were experienced this month in the Victor Valley. 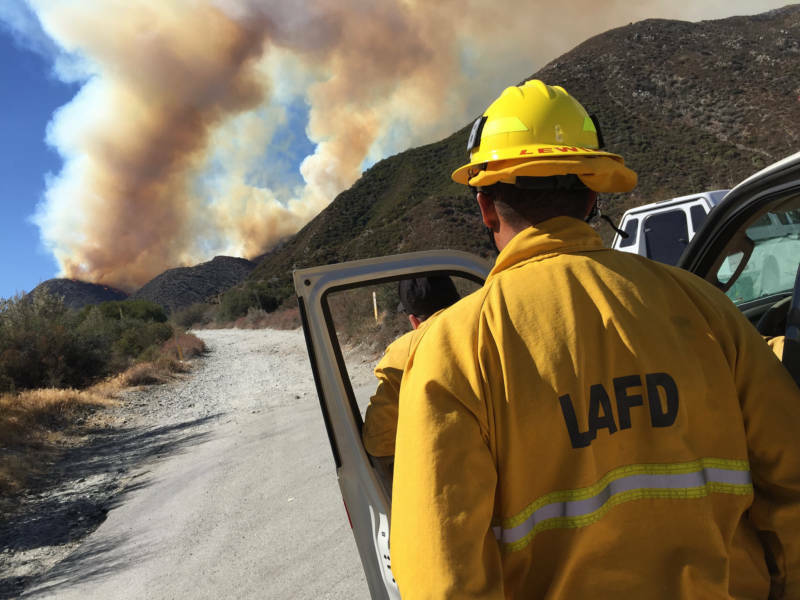 As the district warned valley residents to “limit time spent outdoors” and to seek medical care for respiratory ailments, school and health clinic closures and canceled sporting events were reminders that health impacts from wildfires carry further than the flames. Researchers like Anderson have taken to using the term “smoke wave” to describe the type of multiday impacts from wildfire pollution that were experienced this month in the Victor Valley. The valley contains hundreds of thousands of residents as well as the thoroughfare linking Las Vegas with Los Angeles. Anderson and scientists from Yale and Harvard calculated that 82 million residents of the West will experience smoke waves that are two days or longer during a six-year period beginning in the late 2040s. That’s a 44 percent increase from a six-year period last decade. “We discovered that, indeed, fires will become worse in the future, and that the number of people exposed to what we call smoke waves increases by about 35 million,” said Loretta Mickley, an atmospheric chemist at Harvard who helped lead the study. On a per-county average, the group estimated that the number of smoke waves experienced in the West will increase to about 1.5 each year by the 2050s, up from about one today. The smoke waves are also projected to become more intense — with air pollution during the worst smoke waves expected to worsen more than 400 percent. The research focused on fine sky-darkening particles called PM2.5 pollution. Such pollution is one of the world’s main killers, posing risks in particular to children, the elderly and the sick. It’s released by fossil fuel-burning power plants, internal combustion engines and wood burning.